Many people are well read about the September 11, 2012 Islamic attacks in Benghazi, Libya, a city off the Northern coast of Africa. The recently released movie, 13 Hours, The Secret Soldiers of Benghazi has enlightened many people about the Benghazi terrorist attacks. However, many people are not aware of the deceptive lies by Barack Obama and Hillary Clinton that led to the deaths of four Americans in Benghazi. Hopefully, this blog will energize readers to inform other Internet users of the Obama-Clinton deception. The book, Obama, Islam and Benghazi documents President Obama’s campaign deception to the American people prior to the November 2012 presidential election. Hillary Clinton supported Obama’s deceit of a normalized foreign policy in Africa by not responding to e-mails by Chris Stevens, U.S. Ambassador in Benghazi. The e-mails indicated as many as thirteen Islamic terror attacks prior to the attack on September 11, 2012. Her failure to provide military protection for the personnel at the Benghazi facility dictated by Obama’s charade of a stable foreign policy resulted in four American deaths. Obama, Islam and Benghazi reveals there is a connection between Obama, Islam and Benghazi. It informs Americans that Obama’s early indoctrination in the Qur’an has developed an affinity for Islam and their people; why the Qur’an is the source of discontent in many countries around the world; and what were the Obama and Clinton deceptive lies that caused poor judgment and will to protect Benghazi personnel from preplanned terror attacks. It is to be noted that President Obama awarded former Army Staff Sgt Clinton Romesha the Metal of Honor for bravery in the battle of Kamdesh, a fight that took many lives because military personnel were diverted hunting for Sgt Bowe Bergdahl. After deserting his post, Bergdahl was caught by Islamic extremists. It was Obama who facilitated the release of Bergdahl by trading five high ranking Islamic terrorists from Quantanamo prison to the terrorists. In celebration of Bergdahl’s release, Obama invited his parents to the White House to show support for their son. Obama with Bergdahl’s parents at the White House. But for the brave warriors who fought during the 13 hours in Benghazi that saved many American lives, Obama has not awarded them the Metal of Honor or received their parents at the White House as an act of appreciation for their loss. 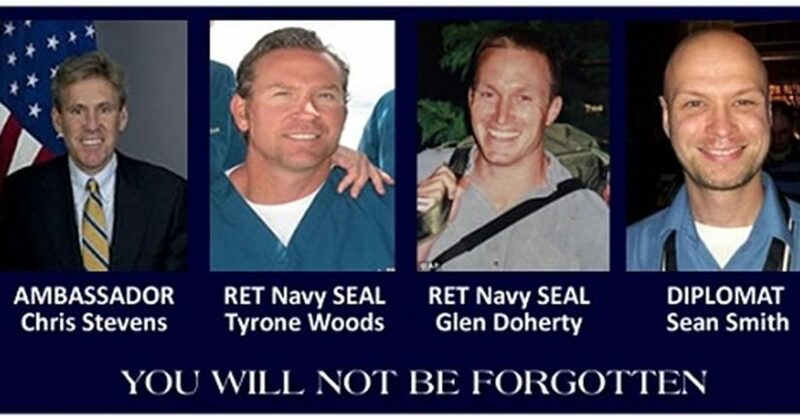 By not honoring the brave warriors Kris Paronto, Mark Geist, John Tiegen, and Tyrone S. Woods killed during the attack, it is clear that Obama did not want to draw any attention to the Benghazi fiasco. His respect for inviting Bergdahl’s parents to the White House but excluding such an invitation for the parents of four brave warriors is amazing. It shows his reasoning powers and sense of American values may have been compromised due to his indoctrination of the Qur’an as a young boy. Could it be that Obama was embarrassed because he may have been asleep at the helm or, as Commander-and-Chief of the Armed Forces, he regrets issuing the Stand-Down Order that prevented military resources to defend Benghazi personnel? White House officials nor Obama has not given the American public any idea what he did during the 13 hour attack. The fabrication of a YouTube lie that was fed to the American people by Obama and Clinton after the attack was an attempt to excuse their inept military response. Your efforts to uncover the truth about what happened in Benghazi to cause the deaths of four Americans is greatly appreciated. After President Obama and Hillary Clinton deceived the American people by fabricating and publically announcing a YouTube story, I was motivated to write Obama, Islam and Benghazi. As the title infers, there is a connection between Obama, Islam and Benghazi. The enclosed book provides ample evidence to inform Americans that Obama’s early indoctrination in the Qur’an has developed an affinity for Islam and their people; why the Qur’an is the source of discontent in many countries around the world; and why the Obama foreign policy deception led to poor military action, which led to the loss of American lives in Benghazi. The last chapter lists 36 questions. Your investigative team objective is to find the truth for the families affected by the Benghazi attack. The questions are presented to validate whether the American people are justified to mistrust Obama and Clinton for their lies which led to the YouTube cover-up story. Hopefully, our Congressional and Senate representatives expect honesty and integrity from the President of the United States. Richard Nixon resigned as a man of honor for his complicity and attempted cover-up of the Watergate scandal in 1972. But his lies pall compared to the actions by President Obama and Hillary Clinton that eventually led to the death of four Americans. Will justice prevail or will our Government representatives permit the Obama-Clinton deceptions to go unpunished? If not impeachment of the President, at least expose for the American people the deceptive lies by Barack Obama and Hillary Clinton. The enclosed book has been sent to each member of the Select Committee. Do you agree or disagree that Obama should be impeached and Clinton disgraced from holding office. Obama, Islam and Benghazi Exposes Obama and Clinton. Orange County, Calif., May 25, 2016 –Nicholas Ginex provides a 2nd edition of Obama, Islam and Benghazi. It reveals President Obama deceived the American people in his run for the November 2012 presidential election. Hillary Clinton supported this deceit by not responding to e-mails by Chris Stevens, U.S. Ambassador in Benghazi, Libya. The e-mails indicated as many as thirteen Islamic terror attacks prior to the attack on September 11, 2012. Her failure to provide military protection for the ambassador and Obama’s authorization of a Stand-Down Order led to the loss of four American lives. Obama, Islam and Benghazi reveals there is a connection between Obama, Islam and Benghazi. It informs Americans that Obama’s early indoctrination in the Qur’an has developed an affinity for Islam and their people; why the Qur’an is the source of discontent in many countries around the world; and why the Obama foreign policy deception led to poor military action in Benghazi. The last chapter lists 36 questions provided to the Select Committee on Benghazi to reveal the truth for the families affected by the Benghazi attack. They are presented to validate whether the American people are justified to mistrust Obama and Clinton for their lies, which led to the YouTube cover-up story. Clearly, these are the words of a Muslim Leader NOT the President of the United States. Many Americans were proud to believe they voted for an African-American. However, it is evident that Obama is – The First Muslim-American President. Will justice prevail or will our Government representatives permit the Obama-Clinton deception to go unpunished? If not impeachment of the President, at least expose for the American people the deceptive lies by Barack Obama and Hillary Clinton. On February 1, 2016, and again on April 11, 2016, this author mailed Obama, Islam and Benghazi with an Open Letter to Trey Gowdy, Chairman of the Select Committee on Benghazi and each of its members. Their efforts to obtain truth and justice for the deaths of four Americans have total support of the American people. Do you agree or disagree that President Obama be impeached and Hillary Clinton disgraced from office. Thank you for your feedback. I hope you share my articles with many of your friends. Next Next post: Will Science and Religion Be Compatible ?